Situated in one of the finest rural-residential areas in Canada on the Northern tip of Vancouver Island’s Saanich Peninsula, the Queen Mary Bay property is an incredible opportunity for residential or commercial investor alike. 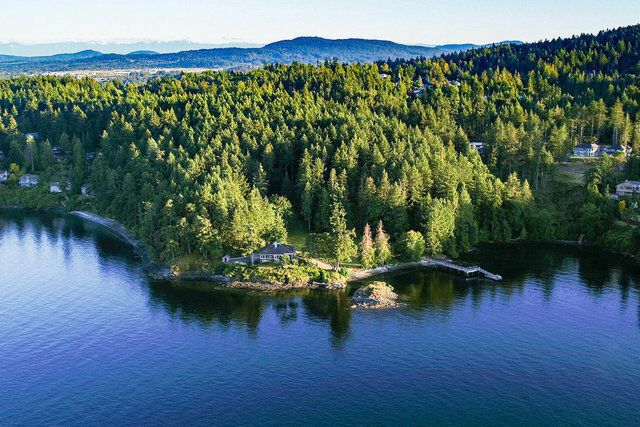 This densely forested 24.57-acre parcel is the largest waterfront property on the Pacific Northwest coast within ten minutes of an international airport offering potential for development as either a private ecologically pristine estate, or sub-divided into a residential housing community. The prestigious Land’s End community offers discerning investors both privacy, and seclusion in addition to incredibly convenient access to international air-travel. Victoria International Airport (YYJ) offers more than 100 daily non-stop flights throughout North America, and has been rated among one of the top ten most-loved airports in the world by CNN Travel, was twice named the Best Airport in North America serving up to 2 million passengers by Airports Council International, and was recently recognized in 2017 as the winner of the EcoStar award for Ecological Stewardship. Offering passengers a small, ultra-convenient terminal, extensive modern improvements and upgrades completed over the last five years, and a 15-year master plan for further expansion and improvement to runways, parking, baggage handling, domestic and international passenger processing, as well as passenger services, YYJ offers Queen Mary Bay residents remarkably hassle-free international travel only ten-minutes from home. Furthermore, inter-island ferry travel departing nearby Brentwood and Swartz Bay ferry terminals offers residents direct routes to mainland Vancouver, Mill Bay, and the Gulf Islands. North Saanich itself boasts the largest concentration of marinas and boating facilities on Vancouver Island counting several located along Sidney’s eastern shoreline, including the renowned Port Sidney Marina. Other marina facilities of note are Canoe Cove Marina, just west of Swartz Bay, Van Isle Marina in Tsehum Harbour, and Deep Cove Marina in Deep Cove on Saanich Inlet. With 1500 feet of ocean frontage, foreshore lease, deep water moorage, and private dock looking out onto incredible views of the surrounding Gulf Islands National Park Reserve, this is the ultimate home base for power and sail yachting enthusiasts, while the calm waters of the Saanich Inlet and its negligible tidal currents are ideal paddling areas for novices and experts alike. A public boat launch at the north end of Land’s End Road at Swartz Bay is the nearest place to launch canoe, boat, or kayak, and strike for any number of nearby islands, or skirt along the coast of the Saanich Peninsula. The boat ramp or wharf in Sidney are perfect launches for an adventure across the channel to Sidney Spit, Princess Margaret Island, the adjoining San Juan Islands, or along the Saanich Peninsula&apos;s spectacular coastline. Sitting on the property are the modest caretakers cottage and the 3,587 square foot custom designed west coast main residence fitted with upper floor master bedroom with five-piece ensuite, two ground level bedrooms, and two additional bathrooms. Beautifully constructed, the home features extensive interior cedar trim and soffiting, vaulted, skylit ceilings, and of course, massive windows framing breathtaking coastal views. The official community plan of the District of North Saanich has recognized that the Queen Mary Bay site’s natural vegetation, waterfront and beach areas, and natural watercourse are considered sensitive, important environmental assets, also noting that its topographic and physical constraints suggest density transfers to create detached housing clusters are desirable. With suggested density of 48 single-family up to 74 clustered units, and exclusion from the area’s agricultural land reserve, this site is an excellent choice for investors looking to capitalize on an innovative new sub-division development opportunity.